So, you are ready to graduate. Congratulations! We hope you look back on your time here with fond memories, and we wish you all the best in your future endeavors! Here you will find information on applying to graduate, as well as registering to participate in Commencement. We confer degrees and certificates at the end of Fall, Spring, and Summer semesters. Students must apply for their degree/certificate prior to the deadline for their final semester. Completing in the Fall Semester (December) – apply by October 1. Completing in the Spring Semester (May) – apply by March 1. Completing in the Summer Semester (July) – apply by June 1. Commencement is only offered at the end of Spring semester. Students are invited to participate in Commencement, regardless of which semester during the academic year they completed degree/certificate requirements. It’s time to claim the proof of all your hard work and apply for your Degree/Certificate. Applying for graduation is EASY and FREE from your eServices account! Once logged into eServices, select “My Academics” and then select “Apply for graduation”. You are only eligible to apply to graduate from the program of study in which you are enrolled. If you need to add a program of study or change your program of study, please complete a Change of Program of Study form. 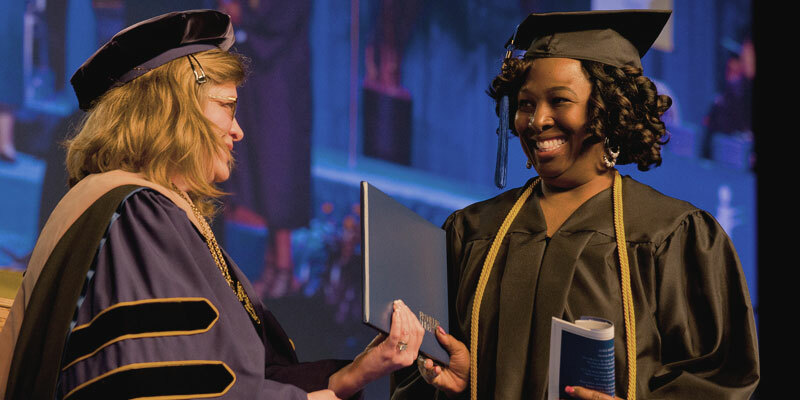 Commencement is an opportunity for you, your friends and family to celebrate all that you have accomplished here at ICC and marks a pivotal milestone in your education. This is a completely optional part of the graduating process, but students must register to participate. Registration deadline is March 24, 2019. Need a replacement diploma? Diplomas can be reprinted at a cost of $25. Click the button below to place your order. Please allow 7-10 business days for processing.